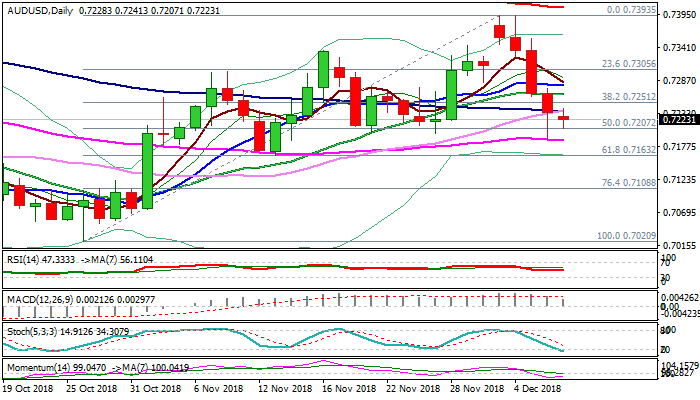 The Australian dollar consolidates after strong fall in past four days (down nearly 2%) which was contained by daily cloud top/55SMA (0.7190). Long tail of Thursday's daily candle signals that bears might be running out of steam and attempts to base. Improved momentum and oversold slow stochastic supporting scenario, however, mixed daily techs lack clearer signal. Daily cloud is narrowing and will twist next week that could attract fresh bears, which require break below 55SMA and pivotal Fibo support at 0.7163 (61.8% of 0.7020/0.7393) to confirm bearish continuation. Strong US jobs data today would add to negative scenario. Converged 30/100SMA's mark initial resistance at 0.7235, followed by 20SMA (0.7263) and 10SMA (0.7279), with break above the later to ease bearish pressure and signal reversal.